ABplus events, PROEVENT Association and Albanian Architects’ Association are organizing on 28th February the second edition of SHARE Tirana International Architecture and Engineering Forum. Mr. Armand VOKSHI, President of Albanian Architects’ Association and Mr. Florin Mindrigiu, Event Director and Founder of Pro Event Association will open this year’s edition. International speakers from countries like Albania, Kosovo, Slovenia, Greece, Netherlands, Turkey, United Kingdom, Germany and Romania confirmed their presence to SHARE Tirana 2019. This edition of SHARE Tirana 2019 will have 3 panels: Tirana Tomorrow – Large Scale Projects, Facades, and Special Guest lecture. Special Guest Architect – Massimiliano FUKSAS (Italy) – Founder at Studio Fuksas, of Lithuanian descent, was born in Rome in 1944. From 1994 to 1997 he was a member of the Planning Commissions in Berlin and Salzburg. In 1998 he was awarded for his professional career with “Vitruvio International a la Trayectoria” in Buenos Aires. From 1998 to 2000 he directed the “VII Mostra Internazionale di Architettura di Venezia”, Less Aesthetics, More Ethics. In 1999 he received the Grand Prix National d’Architecture Française, the following year he was named National Academic of San Luca and was decorated Commandeur de l’Ordre des Arts et des Lettres de la République Française. In 2002 the Honorary Fellowship of the AIA – American Institute of Architects, Washington D.C. Three years later member of the Académie d’Architecture in Paris. In 2006 the Honorary Fellowship of the RIBA – Royal Institute of British Architects, London UK and was named Cavaliere di Gran Croce della Repubblica Italiana. In 2010 he was decorated with Légion d’Honneur by the French President. In 2012 the Medal of the Presidency of the Council of Ministers in Italy, and the Global Lithuanian Award, Art and Culture category in Vilnius, Lithuania. The following year the Idea-Tops Awards, Shenzhen Bao’an International Airport-T3, awarded Best Transportation Space in Shenzhen, China. In 2014 Architizer A + Award and Architizer A + Popular Choice Award, Transportation-Airports category in New York. From 2000 to 2015 he was author of the architecture column – founded by Bruno Zevi – in the Italian news magazine “L’Espresso” and from 2014 to 2015 he was, with his wife, the author of the Design column in the Italian newspaper “La Repubblica”. Architect Mark SUTTON VANE (UK) – Principal at SUTTON VANE ASSOCIATES, one of the top 10 lighting designers worldwide, He designs lighting for retail, residential, commercial, historic, museum, hotel, and leisure projects. Architect Tilemachos ANDRIANOPOULOS (Greece) – Founder of TENSE ARCHITECTURE NETWORK. Born in Athens (1974), Diploma in Architecture, National Technical University of Athens (2001), Metropolis Msc in Architecture and Urban Culture, CCCB- Universitat Politècnica de Catalunya (2006). Founder of Tense Architecture Network_TAN (2004). The practice’s work includes several first prize competition proposals as well as awarded residences: ‘Residence in Megara’ and ‘Residence in Heraklion’ were nominated for the Mies van der Rohe award (2015-2017) and ‘Residence in Sikamino’ was shortlisted for the same award (2013), while TAN participated in the Architecture Biennale of Venice twice (2012 and 2014). Assistant Professor in the School of Architecture of the National Technical University of Athens. Landscape architect and urban planner, Rainer Schmidt (Germany) – Professor of Landscape Architecture and Design at the Beuth University of Applied Sciences in Berlin, the winner in 2017 of The American Architecture Prize for Medium Firm of the Year. Architect Mustafa Kemal KAYIŞ (Turkey) – Managing Partner at GAD Architecture, has 15 years of experience in Architecture. He led many internationally awarded projects. With a master’s degree in real estate development he tries to develop such processes combining pre and post architectural design phases gently with other disciplines using Artificial Intelligence and BIM technologies. He prefers an algorithmic perspective for the architectural design process. Each design phase should be analyzed and developed consciously with data-driven. He focused his studies on Artificial Intelligence in Architecture mostly including Deep Learning techniques. Architect Serban Tiganas (Romania) – Founder of “Dico & Tiganas”, one of the most well-known names from Romania. in the field of architecture. He is currently the Secretary General of the International Union of Architects, past president of the Order of Architects in Romania and the President of SHARE Society. Architect Patrick Meijers (The Netherlands) – Co-Founder of Orange architects. In 2010 Patrick co-founded Orange architects as an architectural office for projects abroad. Orange architects’ first realized project – the Cube in Beirut – was awarded in 2016 with the CTBUH award for best high rise in the Middle East and Africa region. Patrick has participated in various national and international workshops and has been a guest speaker and critic on different occasions. Architect Maks Velo (Albania) – Founder of Maks Velo architects. Maks Velo was born in Paris on August 31, 1935. After his birth, the Velo family returned to Albania, in the city of Korça, where Max has spent his childhood. After finishing the gym, he continues his studies at the Polytechnic Institute, in the engineering branch. He then specializes in architecture and in 1960 participates in the first project in Tirana. He worked further at Tirana’s design bureau. The years ’73 coincided with the beginning of a very difficult time of his life, because during this time he was arrested and sentenced to ten years in prison for modern tendencies in architecture and art, and consequently burned 250 works. His persecution and punishment continued for 18 years from 1973 to 1991. In addition to the architect’s profession, he also creates and composes in some genres of art such as painting, sculpture, prose, poetry, and publicity, as he is constantly engaged in public affairs on issues of urbanism, architecture and various intellectual engagements in the entire Albanian territory. Architect Mihael Dešman (Slovenia) – Founding Partner of Dans Studio Architects. Works as a member of the group DANS Arhitekti since 2004. For his work in architecture he has received many acknowledgements, i.a. European Price for Urban Public Space 2013 – Renovation of the banks of the River Ljubljanica in the section flowing through the old city centre, a collective effort that concentrates resources in a range of specific interventions. His works and the works by the group DANS Arhitekti have been presented at more than 50 individual and group exhibitions in Slovenia and other countries and published elsewhere. Architect Xaveer De GEYTER (Belgium) – Office Principal at Xaveer De Geyter Architects. The director of XDGA, an internationally oriented Brussels based office practicing architecture, urbanism and landscape design on different scales and levels. XDGA has participated in many international competitions allowing the office to build up an extensive portfolio that shows its critical approach to architecture. In 2016, Xaveer De Geyter was awarded the Flemish biennial Cultural Award for Architecture 2015. Recent realizations include the regeneration of the Warehouse MacDonalds in Paris, the GZA care center for the elderly in Antwerp, and the waterfront promenade in Vloré (Albania). Ongoing XDGA projects include the refurbishment of the subway station and public square Place Rogier in Brussels, the new headquarters for the province of Antwerp, a new school building in Ghent, the extension and renovation of the Musée des Beaux-Arts of Tournai, and the master plan Paris-Saclay and Montpellier TGV. Architect Agim MARKU (Albania) – Founder of Marking Plan, is an Albanian architect with 20 years of experience in Architectural Design, Facade Engineering and Construction Management. He participated in the Young Architects’ Competition “EUROPAN 5”, Nagoja, Japan. Worked at the Athenian architecture firm “Betaplan” then he founded his own architecture firm in Tirana “Markingplan”. Since then, he has designed or developed a large variety of local and international projects. Upon the design of few IFI’s funded projects, he was honored with “Attest of Quality Services” issued by EU Delegation, Tirana, Albania. Architect Ardita BYCI-JAKUPI (Kosovo) – Partner of Urban Plus studio. In 2001 she has been engaged in URBAN PLUS studio of architecture, planning, and urban design and where she became a partner since 2005. She has been engaged as an expert, tutor, team member and jury in different activities such as EcoWeek, AIA-The American Institute of Architects, Europan Kosovo, Kosovar Pavilion in Biennale di Venezia. Architect Ardita GUSHO (Albania) – Architect at Kotakt, studied Architecture and completed her Master of Science degree in 2014. From 2014-2016 she worked as an assistant professor at Faculty of Architecture and Urbanism in Tirana, in the sector of residential project designs. She was a local architect for the Residential complex Magnet by Studio Daniel Libeskind and Residential complex Ana by studio City foster also was local architect and team leader of architects for the residential complex Mangalem21 by studio OMA (office for metropolitan architecture). Ardit BEKTASHI (Albania) – Vice CEO at Kontakt, studied civil engineering at Rub University in Bohum Germany, where he completed his Master of Science degree in 2017. He worked as an assistant professor at the Rub University in Bohum, in the sector of geotechnical engineering and tunneling. Now he is involved as a development engineer for new technologies and materials in Kontakt ltd company. From 2018 he is in the position of vise CEO for Kontakt ltd company. 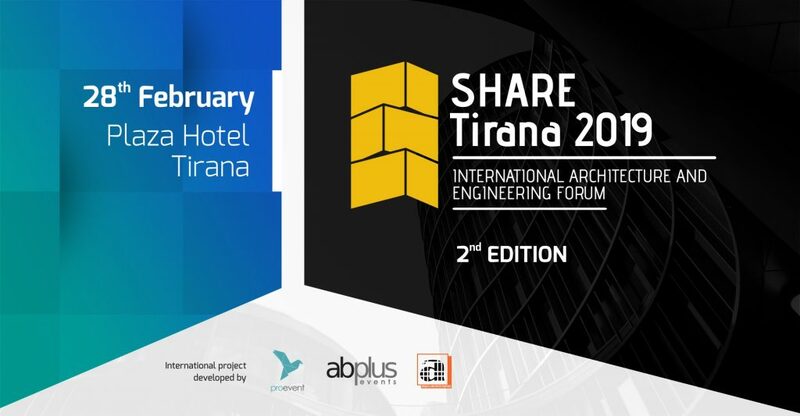 SHARE Tirana 2019 International Architecture and Engineering Forum is an event organized by ProEvent Association in collaboration with the Albanian Association of Architects.